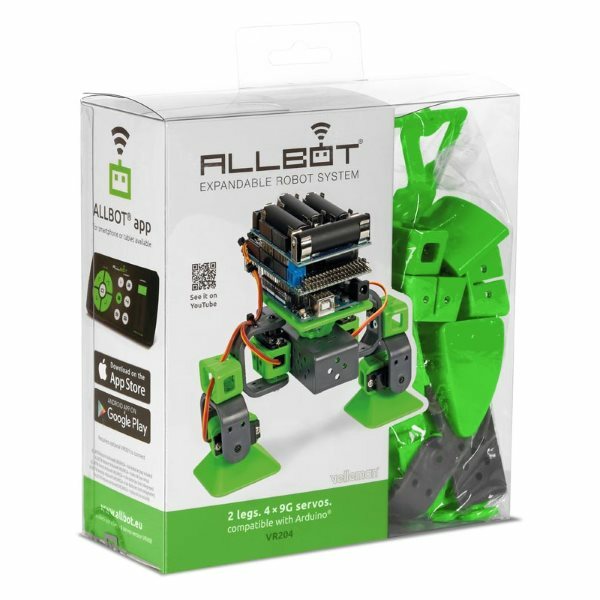 The ALLBOT VR204 Two Legged Robot is an expandable Arduino compatible modular robot body kit featuring two servo controlled legs. This kit attaches to your Arduino Uno or Mega compatible microcontroller to create a small servo driven robot. The two legged robot kit comes with a set of four servos, two Arduino shields and a collection of plastic parts for building the robot body. Everything is included to build the robot body. Just add your favorite Arduino Uno or Mega compatible microcontroller to give the robot some brains. The robot is controlled by a VRSSM servo controller shield. The VRSSM shield can control up to 12 servos when attached to an Arduino Uno or up to 36 servos when attached to an Arduino Mega. It also has a built in serial IR Infrared receiver for optional remote control and a buzzer for making sounds. Connectors are available for attaching servos, analog inputs and a power supply. A VRBS1 power supply shield allows you to run your robot using four AA batteries. It supplies raw battery power for driving the servos and a boosted 12V 300mA power source to feed your Arduino compatible microcontroller. This shield also includes a power switch and indicator LED. 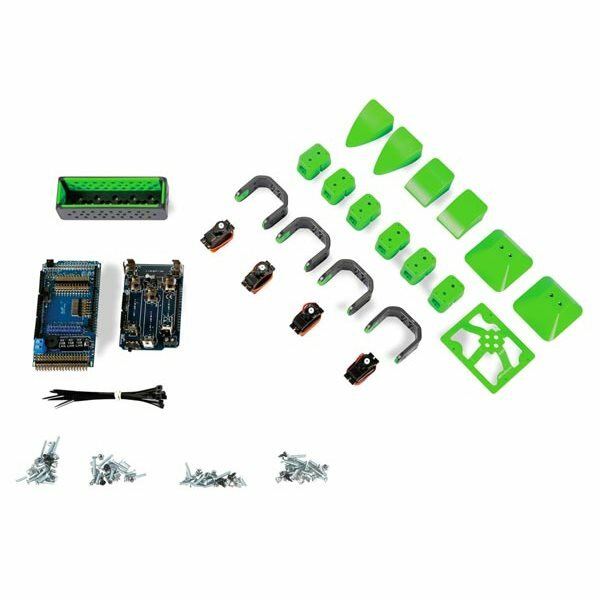 This kit includes a number of plastic parts and hardware for constructing the robot body. The legs are driven by four 9g analog servos. A set of two feet styles is included. The completed robot can be programmed from the Arduino IDE using a downloadable library. Kids can enjoy programming the robot using the Scratch graphical programming blocks. This kit requires basic nut and bolt assembly skills. No soldering is required. It requires an Arduino Uno or Mega compatible microcontroller and some batteries.